Awsworth today is a dormitory area for a collection of nearby conurbations, including the City of Nottingham itself. But walking along “The Lane” in modern times, it’s not hard to transport yourself back a couple of hundred years to the tiny hamlet of the past, surrounded as it was, on all sides, by rural England. And through the mists of time it’s possible to glimpse a fascinating story. The origins of Awsworth go back at least to Saxon times. After that, as the centuries progressed, it came under some dramatic influences: Lenton Priory, whose Prior was executed during the Dissolution, the Lords Cromwell, the Babbington family which met disaster after plotting against Elizabeth, the Sheffields of Butterwick, the Willoughby family of Risley, the Earl of Stamford and more. Awsworth had some interesting early industry too with its 17th century glasshouse, and as the influence of the great families slowly faded it progressed rapidly towards a more industrial future. The English canal system reached the area, and mining, for centuries an isolated and local activity, took its first steps towards operations on an industrial scale. The Industrial Revolution was on the march. Mining became Awsworth’s mainstay, employing both its men and its children, and life for the common people was gruelling. As time wore on, small and hard won improvements became a broader front as a Victorian public conscience began to develop; education improved dramatically and technical improvements, then as now, completely revolutionized the way of life. 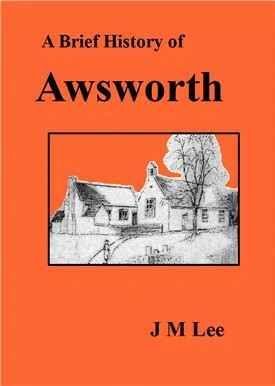 This booklet draws on considerable original research and in many cases Awsworth's immediate surroundings have been included for the sake of clarity. Nearby Babbington for example shares a linked association with the Babbington family, and the area’s complex railway system only makes sense if looked at as a whole. This page was added by John Lee on 30/08/2016.